By the 1830s the former 62-acre farm of Peter Stuyvesant, the Bouwerij, had seen development for two decades. The area filled with homes for the wealthy as well as more modest structures. Among the latter was the prim 20-foot wide brick house at No. 313 East 18th Street. The newly-popular Greek Revival style had done away with the dormered roofs of the Federal style. Instead, a nearly-flat roof provided a full third floor with squat openings. Sitting above a brownstone English basement, the house boasted features that announced its owners were merchant class—floor to ceiling parlor windows, delicate ironwork, and what were most likely double entrance doors. Most of the upscale residents of the Lower East Side had moved northward by the 1870s as waves of immigrants, mostly German, settled in the area. Larger homes were operated as boarding houses and other residences were razed to make way for tenement buildings. But No. 313 remained the private home of Samuel and Yette Broneman. Broneman was born in Bavaria and, like many other German Jewish immigrants, did well in his new homeland. A successful merchant, by the late 1870s he had retired with a comfortable bank account. On December 8, 1880 he was browsing in a store at No. 183 Canal Street when he was suddenly taken ill. A coach was hailed to drive him home, but he died soon after it left the store. Broneman was apparently stricken with a severe heart attack. The driver headed instead to the Mulberry Street Police Station. After Coroner Ellinger inspected the body, he ordered it taken to the East 18th Street house. Broneman had executed his will just nine months earlier. The size of his estate was reflected in his generous bequests to the children of Yette’s sister--$4,000. That amount would equal more than $95,000 in 2015. Yette would live until 1905; but while Samuel left her the house “so long as she may survive,” she soon moved out. While Dr. Vehslage lived comfortably in his 18th Street house, the conditions of many immigrant families in the neighborhood were far less so. The nearby Hashagen family was a case in point. In June 1889 Mrs. Hashagen died, leaving her husband to care for their eight children in their second floor tenement apartment at No. 220 Avenue A. Little four-year old Florence was sent temporarily to Orange, New Jersey to the home of her uncle. The family owned a pet Spitz. On Wednesday, July 24 that dog bit Florence on the wrist. The girl was taken to the Orange Hospital where the bite was cauterized. In the meantime the neighbors killed the dog. Little more was thought about the incident as the wound healed nicely. Around August 15 Florence came back home and two weeks later, on August 28, she complained of a sore throat. The next day Dr. Vehslage was called in. He gave a terrifying diagnosis: rabies. He treated the girl, without results. At 2:00 the following morning Dr. Vehslage was called back. Florence was talking incoherently by now. The doctor returned around 10:00 that morning to check on his little patient; but 45 minutes later, “despite the most heroic treatment,” she died “peacefully in her grandmother’s arms,” as reported in The Evening World that afternoon. Within only a few years Dr. Vehslage was gone from No. 313 East 18th Street. It became home to young Harry T. Munroe, a clerk in the Entry Division of the Custom House. Any prospects of a bright career ended on October 14, 1895 when he died of consumption in the house at just 27 years old. Irene M. Corey lived here briefly, at least from 1899 through 1900, with the two orphaned children of a police officer. Their legal guardian, she received $110.64 a year from the Police Department as their father’s pension. Following Irene Corey in the house was artist Thomas Maitland Cleland. In 1906 he exhibited his “Design for Top and Bottom Printer’s Calendar Sheet” in the annual exhibition of the Architectural League of New York. Born in Brooklyn, the 26-year old had studied at the Artisan Institute. In 1907 T. M. Cleland became art director for McClure’s Magazine. Although his career would encompass a variety of artistic fields—book designer, painter, and illustrator—his typeface designs are perhaps his most recognizable legacy. By the time he moved into the East 18th Street house he had already designed the Della Robia typeface, and in 1917 he designed Garamond No. 3. By 1915 the house was occupied by Fred Erving Dayton and his wife, Helena Smith-Dayton. Fred had started out as a reporter for The Hartford Post and had risen to a top executive of Conde-Nast Publications. Described by the Hartford Yacht Club as “a river rat,” Fred Dayton had been a charter member of the club since the age of 14. But despite Fred’s prominent social and professional position, it was Helena who stole the family spotlight. 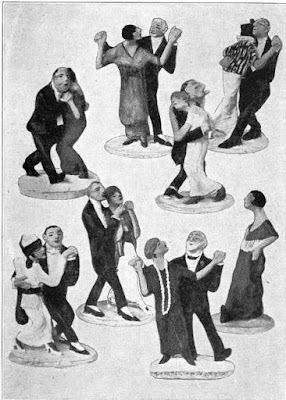 She had been a newspaper and magazine writer, but in 1914 decided to try clay modeling without having had any artistic training. She made what she termed “cartoons”—little figures that gently poked fun at society. Soon Helena’s clay “cartoons” represented the full range of urban society—flower sellers, scrubwomen, shop girls, and lonely women on park benches. Her “Tango Party” consisted of eight figures and couples. It won her the $250 prize offered by Puck magazine for the best cover design in 1915. That the Daytons’ chose No. 313 East 18th Street as their home is somewhat surprising. Fred’s executive position earned him a sizable salary—enough to afford a chauffeured limousine and other luxuries. The cozy, modest home on the equally modest block was unlike the grand homes and apartments of his peers. Although Dayton’s chauffeur, Charles Brown, was not found responsible for the accident, he was served with a summons when it was discovered he had no chauffeur’s license. The house was the scene of the funeral of Helena’s widowed mother, Anna Smith, on Saturday afternoon, March 3, 1917. A year later, on Sunday March 10, another funeral was held here; this one for Helena’s 84-year old uncle, Henry James Smith. Fred and Helena Dayton left East 18th Street before 1925 when the house was converted to two apartments. It was most likely at this time that the entrance was changed to the offset door we see today. While the house was remarkably preserved, a somewhat confusing arrangement involved its ownership. In 2008 the owner, deemed the Life Estate Owner, offered one apartment (essentially one half of the property) for sale to a "Vested Remainder Interest" for the bargain basement price of $1.55 million. No. 313 East 18th Street sits nearly frozen in time, a handsome survivor of the many chapters in the history of the Lower East Side.